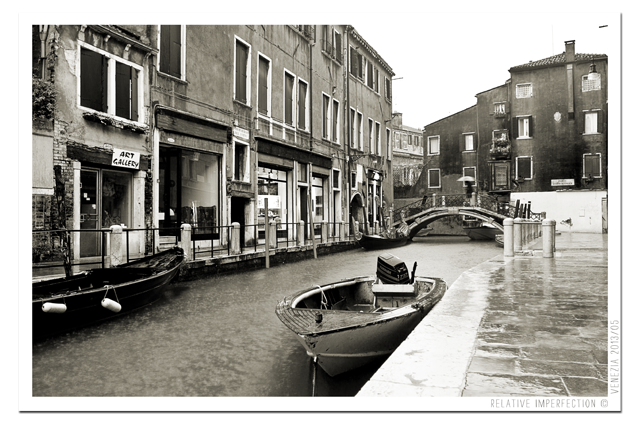 Image | This entry was posted in Photography and tagged bridge, canal, Dorsoduro, gondola, Italia, Italien, Italy, lluvia, puente, rain, street, venecia, veneto, venezia, venice. Bookmark the permalink. Great depth and tone to the piece. Love the way the angles meet – the two buildings angling down into the center and the waterway meeting them. Nice work! – J.
Thanx! Well if you ever go to Venice, this is the place to stay. Dorsoduro is a beautiful area/island. Much more quiet than Venice itself, and with all its charm… And just a walking bridge away… This is the canal that is right in front of the Guggenheim Museum entrance. 😄 C.